The Children’s Health Incentives Lab (CHIL) is seeking high school sophomore and junior students (Classes of 2020 and 2021) to apply to join our Health Corps to receive training and individual mentorship to design and implement a program to promote healthy behaviors (i.e., eating healthy and being active) among their community through the use of behavioral science practices. Applications can be accessed here. The deadline to apply is Monday, January 21, 2019 at 11:59 PM ET. 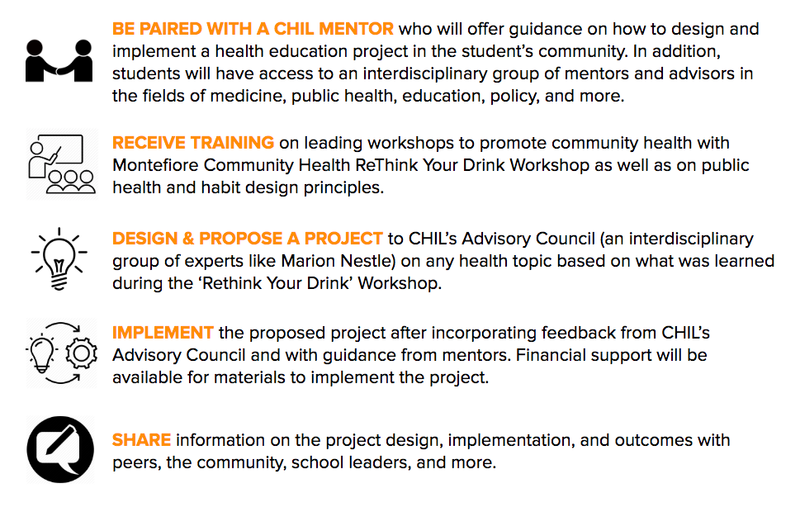 If you have any questions, feel free to email christina@chilnyc.org. We look forward to hearing from you!